for Patients - Anchor Orthopedics XT Inc. The lower back is made up of five lumbar vertebrae, which are separated by lumbar discs that act as shock absorbers and keep the spine flexible and mobile. 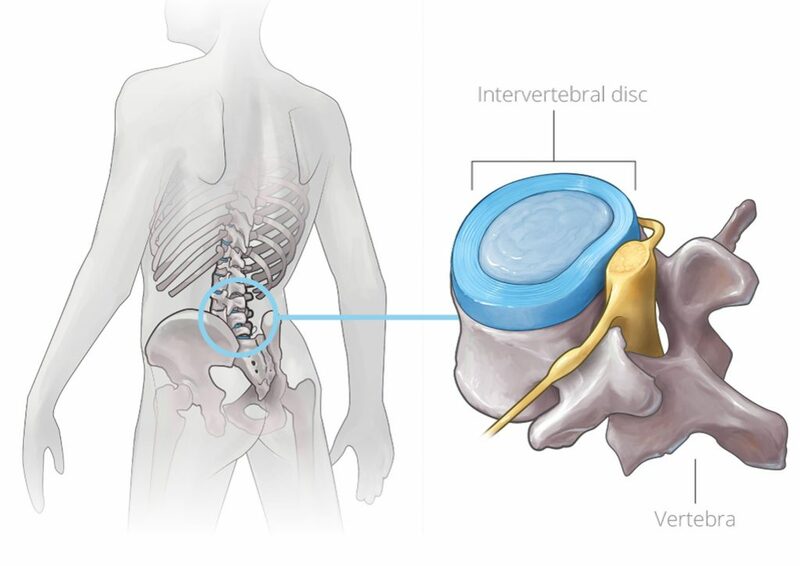 These intervertebral discs are made of an outer, tougher ring called the annulus fibrosus, and inner, softer, jelly-like material called the nucleus pulposus. The highest prevalence of lumbar disc herniation is among people aged 30-50 years. 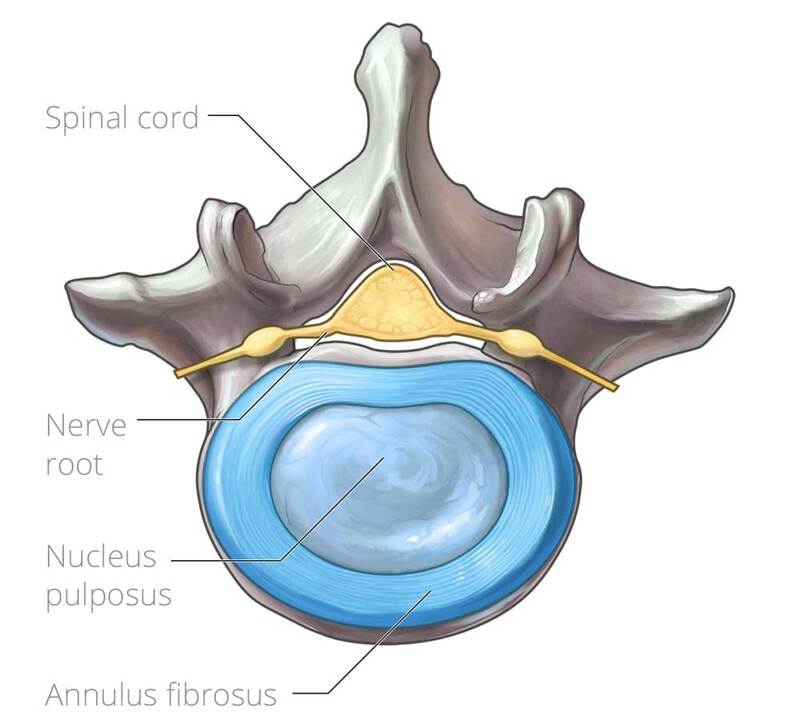 As the disc degenerates, the outer, tougher annulus weakens and allows the soft, inner nucleus to leak into the spinal canal. This is known as a disc herniation. This disc herniation, or disc bulge, can then put pressure on the nerve, causing sciatic symptoms including leg pain, numbness and weakness in the legs. Symptoms associated with herniated discs arise from the pressure or irritation caused by disc material on the nerve root specifically at the level where the herniation has taken place. The most common symptom of disc herniation is sharp leg pain, which increases with movement (Sciatica). Muscle weakness, loss of reflexes, and numbness or decreased sensation corresponding specifically to the compressed nerve root may also be present. In rare but serious cases, the pressure on the nerve can be so severe that it can cause loss of ability to control the bladder and bowels. This condition is called “Cauda Equine Syndrome” and immediate medical intervention is indicated. 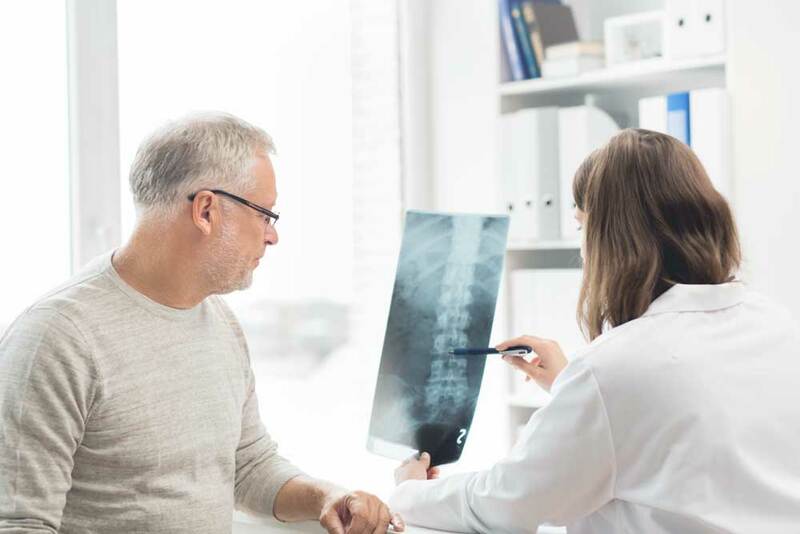 A herniated disc diagnosis begins with a thorough history and physical examination that may include certain orthopedic tests such as “range of motion” and “straight leg raise” tests. The physician may further evaluate the reflexes and test the strength of various foot muscles. Special spinal imaging may be ordered for further evaluation. Plain film X-rays can indicate level of degeneration in the spine, but only an MRI scan can determine the presence of a herniated disc. Microdiscectomy is the most commonly performed surgery for herniated discs, and is recommended when conservative treatment such as rest, physical therapy, anti-inflammatory medication and epidural steroid injections are ineffective. In this procedure, the disc bulge causing irritation and pressure to the nerve is surgically removed and the symptoms may improve instantaneously. The procedure may require an incision to be made in the wall of the disc to remove the herniation. This defect is typically not repaired at the end of the surgery due to the challenges of accessing the tissue needed to close the defect. 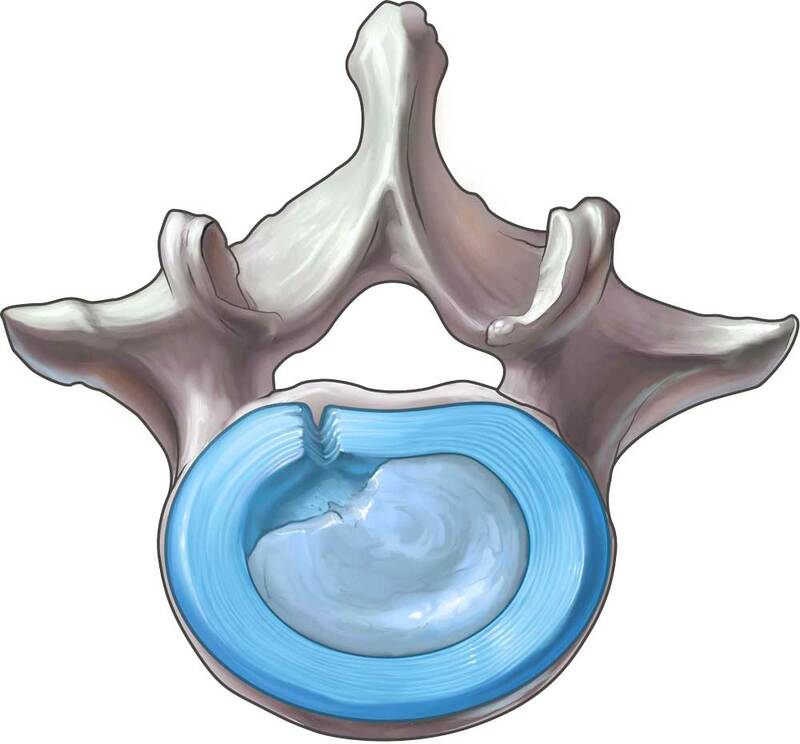 The defect remains open in the disc and can act as a source of future complications. The AnchorKnot® Tissue Approximation Kit is a new option for patients undergoing herniated disc repair procedures, which enables the surgeons to perform the tissue sparing/disc preservation technique. Ask your surgeon if the AnchorKnot® Tissue Approximation Kit may be suitable for you. What is The AnchorKnot® Tissue Approximation Kit? The AnchorKnot® Tissue Approximation Kit is commercially available in the United States of America and Canada. AnchorKnot® products are commercially available in Europe under a different design, configuration, and product name. The AnchorKnot® Tissue Approximation Kit in herniated disc repair procedures enables surgeons to approximate the tissue in a standardized manner. The AnchorKnot® Tissue Approximation Kit is compatible with minimally invasive surgical techniques in herniated disc repair procedures to support the existing standard of care. Your surgeon can determine if you are a good candidate for the use of the AnchorKnot® Tissue Approximation Kit in herniated disc repair procedures. AnchorKnot® Tissue Approximation Kit is a minimally invasive, easy to use product that typically adds five (5) minutes to the total surgery time. The type of surgery can have a major impact on the treatment of herniated discs. 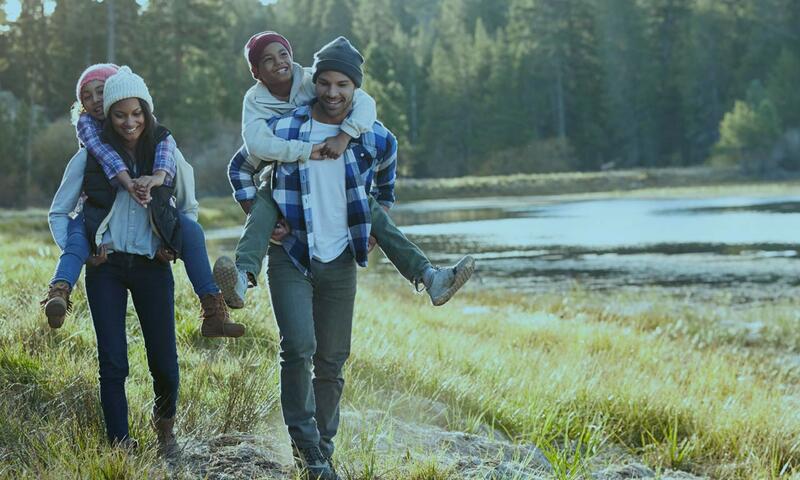 Learning about the risks and benefits of the treatment can enable patients to make an informed decision about how they would like their care to proceed. Talk to your surgeon to learn if you may be a suitable candidate for herniated disc repair. What are the risks or complications for a discectomy procedure? Is there anything you can do to reduce the risk of disc reherniation? What is currently done with the hole that is created in the disc? Am I a good candidate for the use of the AnchorKnot® Tissue Approximation Kit in herniated disc repair? In the United States: The AnchorKnot Suture Passer (2-0), AnchorKnot Knot Pusher (2-0) and AnchorKnot Suture Cutter (2-0) are accessories of the Anchor System. The indications are: The Anchor System is indicated for visualization of the surgical field in any area of the body cut open during a surgical procedure. When used in the cervical, thoracic, or lumbar spine either from an anterior or posterior direction, for example, the Anchor Endoscope and accessories are intended to aid the surgeon’s visualization of the surgical area and allow him/her to perform any type of surgical spinal procedure such as herniated disc repair, visualization of the circumferential decompression of the nerve roots, aiding in the search and removal of nucleus material, spinal fusion, or insertion of spinal implants. Other examples of generic surgical use of the Anchor System would be for use in the knee, ankle, shoulder, hand, wrist, and temporomandibular joint (TMJ). In Canada: The AnchorKnot Knot Pusher (2-0) and AnchorKnot Suture Cutter (2-0) are intended for use during surgical spinal procedures, such as herniated disc repair. The AnchorKnot Suture Passer (2-0) is indicated for passing suture through tissue during surgical spinal procedures, such as herniated disc repair. CAUTION: Federal Law (USA) restricts the use of these devices to or by the order of a physician. Before use, consult product labels and inserts for any indications, contraindications, hazards, warnings, cautions and instructions for use.